First of all make sure you have a Terminal window open. 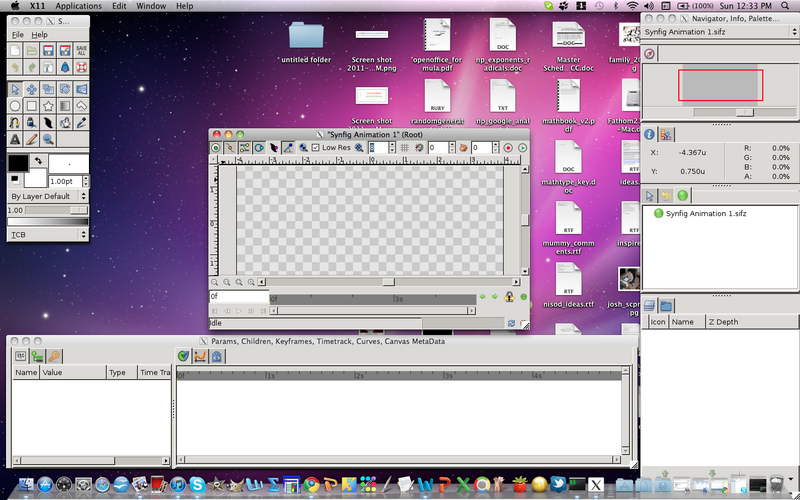 This will be used in order to perform all the steps necessary to compile synfig. # if you installed libxml++ as instructed above, this will already exist. If so, there is no need to execute this command. WORK IN PROGRESS:Note though that this isn't the end of the story: we still need to package everything up into an .app so that the more sane of us can run Synfig without having to resort to opening a terminal. Some parts of these instructions are incomplete and are often changing. The package for etl is not part of the main homebrew fork as of this time, and neither are any other synfig packages. TODO: Describe how to properly package everything into an .app. Describe how to build "synfig" and "synfig-studio" with homebrew. Describe build process w/ gtk-osx. Window focus can sometimes be lost. If this happens, just select a window from another Mac OS X app and then select the Synfig window again. Menus do not function correctly. The file browser doesn't work, so you have to load files from startup. Sometimes mouse focus on windows is lost. To solve this, try moving the affected window. Failing that, you should still be able to use the keyboard to navigate. No input devices are enumerated by GTK. XCode project files exist, but they are currently broken. Thus we just use the terminal to compile everything. Then when prompted again, choose "ignore error and continue to build" (option 2). If you're using native GTK+, change "/opt/local" to "/opt/gtk". If you get an error about display ports, you likely have multiple X11's installed. Just open up your favorite, click on the Applications > Customize… option, and then add an application with the name "synfigstudio" and command "synfigstudio" (w/out the quotes). This page was last modified on 18 October 2015, at 11:59.